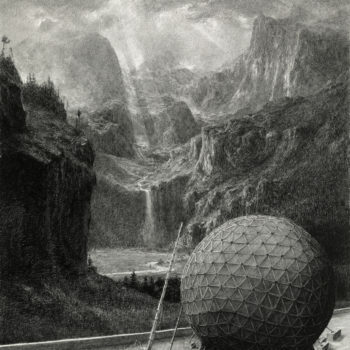 Ethan Murrow is a dreamer, a storyteller. His scenes are well thought out adventures in his mind, full of character and humanity. His heroes often fail, but they never give up. His fantastical scenes take us to the arctic, high above in makeshift flying machines, and always into the unknown. What makes Murrow’s artworks more extraordinary is his chosen vehicle to share these stories. Each composition is meticulously detailed, with lifelike precision in graphite or pen. No detail is omitted and there is no room for error. Murrow creates black and white worlds like pages from historical texts, begging us to enter and explore. His most recent exhibition Jurassic, at Winston Wächter Fine Art Seattle, will focus on the enormity of the Northwest. In this land everything is big. It is “as if trees, mountains, skies and clouds have been injected with steroids”. The enormity of nature makes it seemingly impossible for man to conquer, or even survive. Ancient trees loom over us and grand mountains burst towards the sky. Murrow’s tireless protagonists press on in these worlds with the same care that is taken in creating them. Murrow’s artworks are tributes to mankind’s perseverance, while simultaneously questioning how we view ownership and our relationship to nature. Murrow’s artwork has been exhibited extensively throughout the US and Europe. He is included in prestigious collections, such as the Guggenheim Foundation, the Cornell Fine Arts Museum, the Bemis Center for Contemporary Arts, the Clay Center for Arts and Sciences, and the Facebook Corporate Collection. In June of 2015 Murrow is honored with a mural installation for the Sandra and Gerald Fineberg Art Wall at the Institute for Contemporary Art Boston. Please join us for the opening reception on Monday, April 20th from 6-8pm or contact Judith Rinehart at Judith@winstonwachter.com for any additional information.